Yarmouk, unofficial refugee camp, is a district of Syria's capital, Damascus and was established in 1957 when thousands of Palestinians were displaced by Israel. The camp has become one of the strongholds of the pro-Palestinian Liberation Organization (PLO) in the last few decades and has therefore established better relations with the Syrian regime. After the clashes started in 2011, camp residents, suffering from poverty, were subjected to fierce battles between the groups loyal to the regime and the opposition groups. The regime has not avoided bombing its residents and cutting supply lines for food and water. At least 166 camp residents, including dozens of babies, have starved to death in recent years as the regime did not allow the influx of humanitarian aid materials. Thus, the victims of the Arab-Israeli wars became victims of the civil war. And now, the residents' bad luck has left them stuck in between the Islamic State of Iraq and al-Sham (ISIS) and the regime, with neither side behaving well. ISIS militants captured the Yarmouk refugee camp by allying with the al-Qaida-affiliated al-Nusra Front. After facing severe food shortages, the lives of thousands of Palestinian refugees residing in Yarmouk camp in the south of Syria have faced the militants' aggression. Until the assault, ISIS did not have a major presence in the camp, as the insurgents were loyal to other opposition groups. It is not possible to receive verified news from the camp as Palestinian officials claim that ISIS was expelled while activists say that ISIS has gained more ground, controlling at least 90 percent of the camp. In response to the ISIS's advance, local armed resistance appeared in the camp, especially by the leftist and pro-regime Palestinian factions. A week after ISIS captured the camp, the clashes with the Palestinian factions intensified. "A group of 14 Palestinian factions said Thursday they backed a joint military operation with the Syrian government to expel ISIS militants," AFP reported. PLO official Ahmed Majdalani said "the factions' support a security solution that will be carried out in partnership with the Syrian state and will have as its priority maintaining the security of citizens." Heavy fighting erupted on Friday in the Yarmouk Palestinian refugee camp, pitting a united Palestinian force against ISIS, AFP reported in reference to activists. Khaled Abdel-Majid, the secretary general of the united Palestinian factions was quoted by AFP as saying "Fighting has raged since the early hours of the day on the edge of the camp, which is close to the area of Hajar al-Aswad where, ISIS has bases already." "Our force is now in the center of the camp after confining Islamic State terrorists to only 35 per cent of the camp," he told DPA news agency by phone. His claim could not be independently verified. Britain-based Syrian Observatory for Human Rights said government forces had shelled Yarmouk with artillery without reporting casualties. Last week, Palestinian President Mahmud Abbas, who did not conceal his anger with the factions in the ongoing war, said that "residents of Yarmouk had been victimized by Syria's civil war. The Syrian government forces and different rebel factions were clashing and we pay the price." The PLO in Damascus has formed a "cell to handle this tragedy and they are trying to work it out with the least losses," Abbas said. "We are in touch with our brothers there to find a way out and protect our people," he added. It was expected that PLO that has well-established relations with the regime both historically and ideologically, will take action against ISIS. However the group changed its stance and rejected the idea of joining the conflict. PLO made the change over its position clear through releasing a statement from its headquarter in Ramallah. ""We refused to drag our people and their camps into the hellish conflict which is happening in Syria and we categorically refuse to become one of the parties involved in the armed conflict that is taking place in Yarmouk. We refuse to be drawn into military actions, whatever or wherever they are, and we call for other means to ensure the safety of lives in Yarmouk and to prevent more destruction and forced displacement." There was no explanation for the changing stance of PLO. 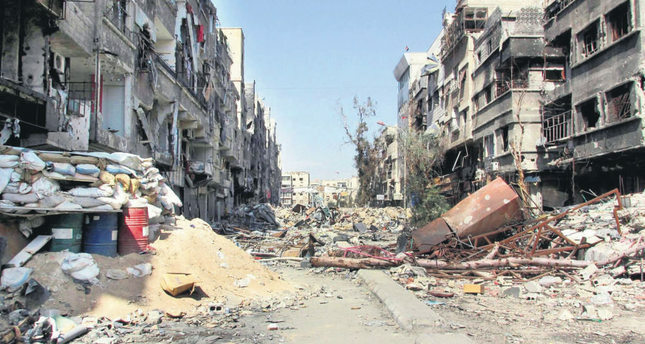 But experts said that the efforts made by PLO and the Palestinian Authority for the recognition of Palestinian State by European countries might have triggered the refrain from cooperating with the regime that has lost its legitimacy and is sanctioned by the West.The besieged Yarmouk camp is located on the outskirts of Damascus, home to the largest Palestinian refugee community in Syria. Before the Syrian war erupted in 2011, it accommodated more than 180,000 Palestinian refugees. However, due to severe security conditions, around 140,000 refugees have been internally displaced as a result of the war. The recent reports state that over 18,000 civilians trapped in the camp have been suffering from desperate humanitarian conditions, without access to basics. The Arab uprisings, which euphorically swept across the Middle East and North Africa several years ago, appealed to Syrians who had lived under the dictatorship of the Assad family since 1970, when Bashar's father Hafiz Assad seized power. Since then, the majority Sunnis were forced to live in a police state that tried to control every movement, organization and business through the use of a wide-ranging intelligence service. In March 2011, Syrians were emboldened enough to raise their voices against the dictatorship. However, the regime's response was not as peaceful as the protests, and the country was subsequently dragged into a deadly civil war after opposition groups took up arms against the government. The Syrian civil war has now entered its fifth year and has caused the death of more than 200,000 people and at least 60,000 are missing. The war has also displaced nearly 10 million people. While the international and regional powers continue endless discussions, the regime does not just use conventional weapons, but also chemical weapons. About 13.6 million people, equivalent to the population of London, have been displaced by conflicts in Syria and Iraq, many without food or shelter, the U.N. refugee agency revealed. The 13.6 million include 7.2 million displaced within Syria – an increase from a long-held U.N. estimate of 6.5 million, as well as 3.3 million Syrian refugees abroad, 1.9 million displaced in Iraq and 190,000 who have left to seek safety. The vast majority of Syrian refugees have gone to Lebanon, Jordan, Iraq and Turkey. Western countries have been frequently criticized by aid agencies and the U.N. for not opening their borders to the Syrian refugees as the most developed countries have received the least number of refugees.